Custom Adhesive Coupons Printed in Bulk in Full Color. Promotional, Very Inexpensive. Budget Prices in the USA and Canada. 3" x 2-7/8", 25 sheet or 50 sheet. 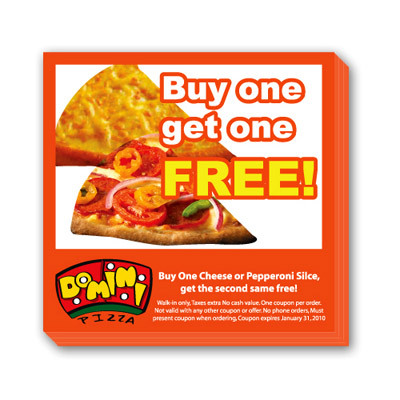 Wholesale Promotional Sticky Coupons on sale. Made in USA, Adhesive, Gloss Coated, QCA Certified, Lowest cost in North America. Free Artwork Design. American Clients pay no taxes. The unit prices below include your 1 color to full color custom imprint. Imprint Colors: Includes 1 color to full color (4 color process).